Vinod Sankaranarayanan, a Project Management Consultant at ThoughtWorks has advised many organizations in the Finance, Travel, Retail and the Healthcare space. Along the way he has handled several large project delivery responsibilities. He has witnessed and driven several sourcing transitions for his clients. 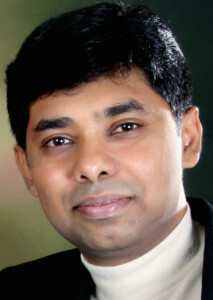 Vinod started his professional career in the pre-Agile era and later adapted to the Agile model of working. This has enabled him to empathize with and provide practical suggestions to clients who often find themselves making Agile transitions and sourcing transitions at the same time. Vinod has essayed the roles of a business analyst, tester, pre-sales consultant, program manager, account manager, Agile coach and practice leader as part of his long IT journey. Before ThoughtWorks, Vinod worked at Mindtree a well-known IT services organisation. At Mindtree he was one of the founding members of the Business Analysts Council and the Agile Council, focusing on creating organizational capacity to win and execute consulting as well as Agile projects.